before the closing date of 28-11-2018. Download application form from the official website of www.Subarnapur.nic.in. These vacancies are under NHM Subarnapur for 11 months of contract basis. GNM or ANM diploma having candidates who are registered with Odisha Nursing Council they can apply for this NHM Subarnapur recruitment 2018. 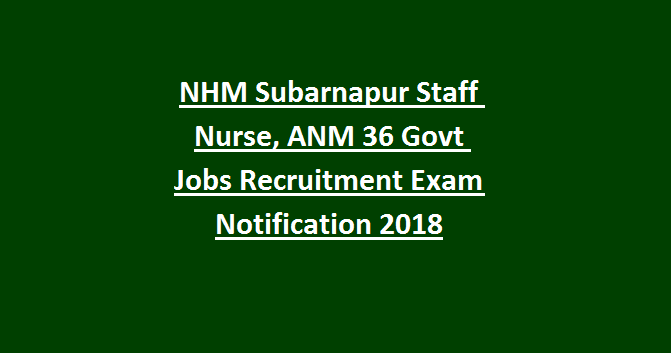 NHM Subarnapur District Staff Nurse, ANM jobs recruitment age limits, qualification, selection process and application form given below. 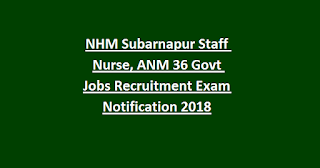 There are total 36 posts in this NHM Subarnapur recruitment 2018. Age limits are 21-32 years. Candidates must have registered with Odisha Nursing Council. Candidates selection will be based on merit in educational qualifications and documents verification for this NHM Subarnapur district recruitment 2018.